I encountered four errors while upgrading from Oneiric to Precise, and upon reboot apport auto-launched reporting all four. This is one of them. I have a screenshot to attach and a bit more info so be patient. Two of the others are bug 986791 and bug 986792. I also need to clean up a couple of duplicates - I've never encountered apport going wild with respawning error reports like this so give me a bit to sort this out. Please also see bug 986791, bug 986792, and bug 986798. These are all related to the same Oneiric -> Precise upgrade. I took a screenshot of the error during upgrade so I'm attaching it, the full text message was, "subprocess installed post-installation script returned error exit status 2". Failed to process /etc/kernel/postinst.d at /var/lib/dpkg/info/linux-image-3.2.0-23-generic.postinst line 1010. Which seems to indicate this is actually an error with grub. I'm going to mark this as a duplicate of bug 916077 for now and will follow up with the release team regarding this issue. Please continue to follow 916077 for this issue. Thanks. Not a duplicate - grub-installer runs during the installer, this clearly isn't that. Erick, please post the output of 'grub-probe -vv --target=device /' and the contents of /proc/self/mountinfo after you encountered this bug. grub-probe: info: cannot open `/boot/grub/device.map'. Or do I need to poke about in the history logs? I'm super tired ATM so excuse me if I'm being dense. One thing I think I should mention is that of these four errors the first to appear during the upgrade process was bug 986798 if that's helpful. the upgrade and not reboot before debugging it. your partitioning setup and exactly how you performed the upgrade? Oh, and the order doesn't matter - they're all basically the same error. Yes, the 80GB drive was blank. And the apt history log shows it was installed 2012-04-19, will attach. Do you want me to repeat? If so should I use the same partition? I currently have sda14, 17 ,and 18 unused. Of course installing Oneiric + the upgrade will take approximately 2 1/2 to 3 hours. Just reviewing this and I guess I was somewhat indirect in answering Colin's question in comment #9. I installed and updated Oneiric on 4/19 in preparation for iso/upgrade testing. Other than being on a multi-boot drive the install was typical - only / + swap - nothing fancy. On 4/22 I booted into that Oneiric again, updated it, and then ran 'update-manager -d -c'. Downloading and installing the updates seemed to go great until I encountered these four errors. To be honest I don't see a problem. I installed synaptic after all reporting was done just to use it for examining the situation and those packages are installed and updated to the proper version. Could this have just been an apport fluke? The only other "oddity" I can think to mention is that I use a KVM switch to share two PC's with the same monitor, keyboard and mouse. But that's never been an issue in the past. Still worth mentioning, but I really hadn't done any switching near the time these errors occurred. I did save this install just in case we might be able to pull any info, but anticipating that we may need to retest I have a fresh, updated Oneiric on sda14 now. 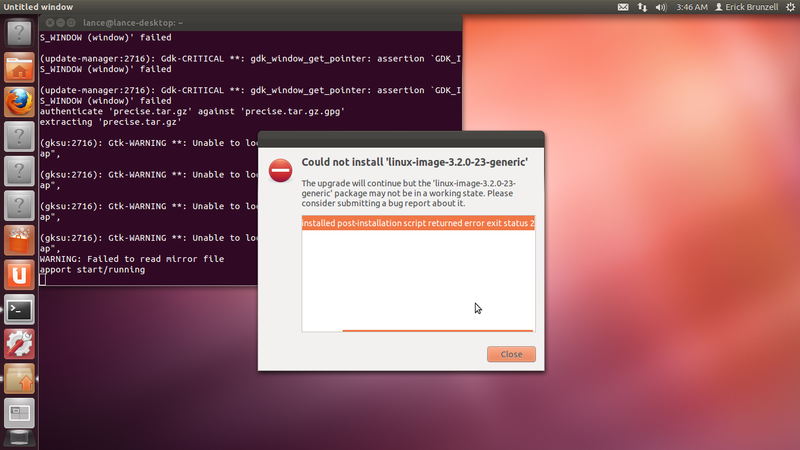 I'd also previously done an Ubuntu Lucid -> Precise upgrade and an Lubuntu Oneiric -> Precise upgrade w/o any errors. But I went ahead and prepared for retesting just in case we have a rebuild. I changed the status to Invalid because we shouldn't really be faced with Oneiric -> Precise upgrades anymore at this point.